This paper presents a deep logical error in most people's thinking, that is introduced right at the beginning of thought, and then stays in the thinking until the conclusions are reached. The conclusions are then wrong, but when they are examined there doesn't seem to be anything wrong with them. Nor does there seem to be anything wrong with the reasoning - as people check back, each step seems to be correct. This is because the error was already in place before reasoning began. Even worse, the conclusions people reach in one area seem to match the conclusions they reach in other areas. This is because the error has a particular character wherever it appears, so one conclusion that contains the error has a relationship with another that also contains the error, which makes them match up. The problem distorts deductive reasoning. It does not distort inductive reasoning, but it makes inductive reasoning appear inadmissible to many people who have done some deductive reasoning with the Ghost Not and turned their minds effectively inside out. Artists. They use intense inductive reasoning (intuition) to spot implicit patterns and express them. They shun deductive reasoning and claim that it is in itself flawed. For some this leads to a paradox of trying to achieve clarity without being clear, which the best avoid by achieving expressions that are deeper than words. Since their social interactions are Ghost Not polluted, they learn to maintain a buffer zone around their art, which they simply refuse to allow any deductive discussion of. This impoverishes society, since there are a great many truths that can be understood deductively but cannot be reached deductively, as Kurt Godel proved in mathematics. Scientists. They use deductive reasoning to analyse explicit patterns and express them. They shun inductive reasoning because they have the Ghost Not inspired delusion that phenomena do not exist unless they themselves know of a viable causal mechanism at that moment. The best of them avoid this problem by achieving paradigm shifts - recastings of the perceived universe that are deeper than words. Since most scientists believe that is it their primary duty to enforce the orthodox paradigm rather than discover the truth, achieving a paradigm shift usually involves waiting for a generation of scientists to die, as Thomas Kuhn explained. Alchemists. They use deductive reasoning to illuminate the harmonies they perceive inductively. They use their logic to track what is there rather than what they have admitted to their inner simulations. By seeing what is there they have no conflict between deductive and inductive perceptions, and the correct single mode of perception emerges. The results of their contemplations are immediately encoded as modifications to their own perceptions, in a way that is deeper than words. They come to see on all the levels and into all the worlds. They never forget. They freely mix the tools and language of artists and scientists in a way that the half cultures insist is impossible. As they do so, they realise that the single way of seeing is a reality that "art" and "science" (as these words are usually understood) are mere shadows of. Isaac Newton was an alchemist in the true meaning of the word, and all the great mystical teachers prize rational thinking. This is an alchemical paper. It starts by borrowing from van Gogh to describe the core idea of seeing like an artist that it is going to explore. Scientists should not be worried about this - where do axioms come from? Then van Gogh, Magritte and Freud help to compare seeing like an artist to the way most people currently do seeing. Then it makes an important philosophical point about the property of symmetry that is found in our universe, and just where we can and cannot reasonably expect to find it, with a little help from Allen Ginsberg. All of these ingredients are then put into a single context, using the Primary Algebra of George Spencer-Brown. As ideas from art criticism and mathematics are introduced, they are explained. It is very important that both artists and scientists reading this paper realise this, since it is only by using both aspects of the One Culture together that what this paper discusses can be fully understood. It is not the case that those parts that use mathematics are inherently beyond the comprehension of artists, or the other way around. Both are nothing without the other. At this point the Ghost Not is wholly exposed. The paper then builds up a series of examples, from the simplest logical OR operation through a few levels of mathematical examples to complex human emotional, social, philosophical and scientific contexts. At each level it shows how the Ghost Not appears to distort conclusions in its characteristic way. In the final sections, it makes some comments on a culture that has evolved with all of its thinking distorted by the Ghost Not. These are the areas where understanding the problem will allow us to make improvements. When he pulls the trick off, van Gogh has to do two quite distinct things. Firstly, he has to spot something worth conveying. This might just be something direct, such a particularly spectacular view. More usually, an artist will try to convey deeper impressions than this though. Here, what van Gogh has done is notice that the wheat in the field has been scraped into the same texture as the stormclouds. Although invisible, the same force (the wind) is behind both patterns. His painting thus celebrates the power of the wind, which cannot itself be painted because it is invisible. He then goes beyond this though, and shows that the track itself seems to have been pulled in the same way the wheat and the clouds have been. Can it be that there is a deeper principle behind both the wind and the historic forces that define the path of a track? Perhaps a modern physicist might think about fluid dynamics here - certainly the philosopher Plato would be sympathetic to the idea that the equations of fluid dynamics are "deeper" than their resultants - wind and track paths. Then look at the crows in the sky. They alone are not distorted by the action of this principle - the wind and perhaps what lies behind it. Perhaps the crows both individually and in their flock, are in some way creatures of - their behaviour is governed by - the same deep principle. Then look once again at the wheat. The raw energy that has scraped it is not the only thing that causes it to resemble the clouds, which have been shaped solely by the wind. It is quite clear that the scraped appearance of the wheat ears derives in part from the regular planting pattern that we see at the front of the picture. Is there another creature about whose nature derives from the deep principle behind wind and crows, that has done this? Quite a lot of ideas for one eyeful. The sensibilities and editorial skills of van Gogh spotted an impression worth conveying, that caused him to experience a great deal of the world, in its own context, in one go. To do the job, van Gogh must allow sensory data to enter his eyes uncritically, and wait for the relationships that are implicit in the data to emerge as he rolls the raw data around in his head. When he had completed this task, the job of finding something to paint, his second task began. The second task was now to un-notice what he had noticed. Rather than paint a cloud that looked like a field, he must use his technical skill with his materials and a kind of honesty to simply record the visual image that had brought the impressions to his mind. He must leave it to the viewer of the painting to either agree with him or not, that the data he has recorded suggest a relationship between say, planted fields of wheat, windtorn clouds, and farm tracks. In both of these tasks, van Gogh must perceive uncritically. He must allow sensory data to enter his awareness without asking what it "is", and only later in either his mind, or the mind of the viewer, should the pattern he will (or has) becomes aware of, take form. This is seeing like an artist. It is exactly the same as the honesty that the physicist Richard Feynman insisted is necessary to make any progress in understanding nature. See what is there, not what you expect. Most people do not usually see like artists. Instead they do something more complicated that they have subconsciously learned to do. First, the sensory data enter their heads. That bit is unavoidable. At that point they categorise what they have seen. If it is a field of wheat before them, they categorise what they have seen as a general issue field of wheat. They then put a general issue field of wheat on a kind of internal whiteboard that they keep in their minds for this very purpose. Then they make with the exaggerated Marcel Marceau impersonation, step back from their whiteboard in amazement and cry, "Gosh! A field of wheat!" as if it were the first time they have seen it. Why would anyone do such a thing? The reason is that they do it so as to be able to edit what they see as they make the transcription from reality to the internal whiteboard. A brutal dictator can see seen as the beloved father of the nation. Winston Smith in Orwell's 1984 can become able to see exactly as many fingers being held up by O'Brien as O'Brien wishes. Not see one number and say he sees another - Smith in all sincerity "perceives" what O'Brien wants him to. The same thing happens to the mystified people documented by Laing. They perceive the behaviour of their relatives as kindness, not cruelty, and then cannot understand why they are unhappy. There is a commonly held view that the great painter van Gogh was er... so poor a painter he couldn't get perspective right, and so painted a wonky looking bedroom. Not so. When a TV documentary crew visited the house, they discovered that the room does not have right angle corners, and the wall with the pictures on it is so short, that for an adult to lie in bed, the bed would have to protrude across the door. Again, van Gogh painted exactly what he saw. People who transcribe into standard issue beds, corners and walls however, "know" that the angles recorded by van Gogh "cannot" be correct, and then glibly assert that the great painter was a terrible painter! 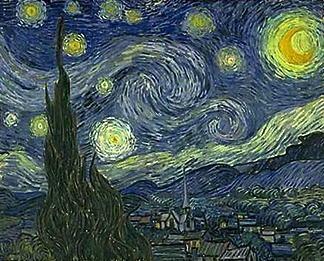 For a final example from van Gogh, consider the famous "Starry Night" painting. 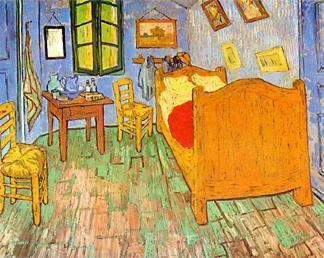 Conventional perception would suggest that van Gogh was simply a nutter. The painting does not contain "proper" stars, sky or anything else. If however we keep faith with van Gogh, and ourselves see simply what he recorded, we have the opportunity to notice something hidden amongst several little clues. Firstly, stars really are different colours although it is surprising how few people realise this (since every time they look up they "see" little white dots as in Classic Star Trek SFX). But these stars have the red end colours all in the middle, and the blue end colours strongly scattered - by atmospheric effects. And each star has a huge umbra. Next, look at the air flows against the hills that van Gogh has somehow discerned and recorded. Anyone who has lived on a hillside knows the wind blows up a hillside - not down. Something is pushing the wind downwards. Look also at the clear sky, and the band of fog hugging the hills. Finally look at the tree - that is no blustery wind - it is being pushed left by a sustained force. The conclusion is obvious. If we can forebear from "correcting" van Gogh, we learn that before the Wright brothers made such issues important enough to study, there was a meteorological temperature inversion just above the ground effect on the night the painting was made. Making the big sky turn over like a pancake and turning it into a chromatically distorted lens. Which van Gogh got right in detail, because he painted what he really saw. Which was how he captured the majesty of it too. For as Feynman said, perception only adds, never subtracts. The surprise is - these problems with conventional perception are just the secondary ones. The remarkable thing about the Ghost Not is that no self delusion need occur, and the transcription can be completely faithful to the reality, and the worst effect will still hit home. The very act of setting up the internal whiteboard is enough to do it. To see why the subconscious habit of "narratising" - transcribing perception onto an internal whiteboard before admitting it is there - is so problematic, we need to take a little time to consider a subtlety in how we represent existence in our minds. This part may seem rarified but please bear with me - the consequences become practical very quickly. And when he wishes to propose that that which exists does not exist, he simply doesn't make a mark! So the artist uses a blank to indicate existence in his mind (whatever the universe chooses to put there), and a mark to indicate that what the universe is doing, it should be imagined to be not doing. The dyadic uses a mark to indicate that he has acknowledged the existence of something, and a void to indicate that he has not acknowledged it. Of course the dyadic has "forgotten" that he is counting acknowledgement, and proceeds as if he is counting existence. Thus an artist uses a mark for non-existence and a void for existence, while the dyadic does it the other way around. 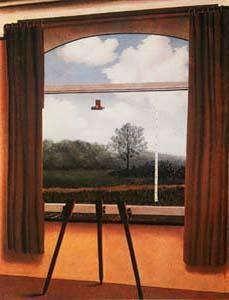 The effect is to produce the situation in this painting called "la condition humaine", by Rene Magritte. It is usually taken that the human condition that Magritte was describing here was primarily one of alienation, as described by Sigmund Freud when he founded psychoanalysis. The Ghost Not concept however, suggests that it was Magritte who had gotten to the essence of the issue, while Freud's alienation is an effect that derives from the real isolation. The real isolation comes from the need to transcribe every external perception into a shallow internal one before acknowledging it. To replace the infinite space behind the clouds in the reality with the blankness on top of canvas in the inner painting. To cross a system boundary, to invert sign, to artificially isolate one's self from the rest of the universe. The inner painting in la condition humaine can be taken as a literal internal whiteboard onto which transcription is done. Like van Gogh, Magritte somehow managed to paint exactly what he saw people doing. Why does this sign flipping, this inverted use of the mark by conventional perceivers matter? Clearly sign flipping is unavoidable by conventional perceivers, but why does it matter? Are not the marked and unmarked states symmetrical? Might we as well say Green/Blue, True/False or Up/Down as readily as Marked/Unmarked? The answer is no, for a very remarkable reason. First, Spencer-Brown showed in "Laws of Form" that Boolean logic can be done with one symbol to denote operands and operations. True/False and Blue/Green are two valued logics, while Marked/Unmarked is one valued. Next, we must ask why we can do Boolean logic with one symbol and the answer is most remarkable - our universe is logically asymmetrical! it is the absolute world. There is no other world. I am living in Eternity. are the ways of Heaven. Our universe is logically asymmetrical at the deepest ontological layer, and the symmetries we see within it are emergent from the essential asymmetry. As we shall see, it is the fact of our universe's logical asymmetry that makes the choice of marked or unmarked state to denote existence very important indeed, because the answers really do come out differently. We can recap the ideas discussed above in a very stark and elegant way that brings out the key point, and then allows us to see the consequences of the error in how we see the most primitive logical operations, which usually we take as being solid. The Primary Algebra was introduced by George Spencer-Brown in "The Laws of Form". It is a very, very simple way of doing logic. He starts with a blank space, which he cuts in two. He now has something to talk about, because the two halves are different. Then he says that if there is another boundary found inside the existing one, you should think of the contents as being out of one half of the original distinction, and so they must be in the other half. He doesn't need to have any symbol at all on the other end of the last equals sign, because he indicates FALSE, and NOT with the mark, and TRUE with a complete blank. Whether he needs to represent a FALSE in the inputs to such a sum, or a NOT operation in the sum, he uses exactly the same symbol. And because he can construct any logical operation he likes out of correctly arranged NOTs, he can now do arithmetic below the level of Boolean algebra. You just replace the letters with a mark if they are FALSE, and nothing at all if they are TRUE, and work out the answer by arithmetic, as above. It is very, very, simple indeed. The Primary Algebra contains the essence of logic. Now think about what happens when a person perceives conventionally. Instead of allowing sensory impressions to arrive, and allowing the wheat field, crows or whatever to emerge in their mind, they drag each object onto their whiteboard, and as described above they end up being forced to use a mark (in other words, do something) for TRUE (or existence), and no mark for FALSE (or negation of that which exists). In terms of the Primary Algebra, they drag each object across a boundary, and so change its sign from TRUE to FALSE and vice versa. The algebraic description of the dragging contains exactly the same situation as the cognitive processing description. In the very act of seeing something, conventional perceivers must, inherently, sign-flip. Recall the seemingly abstract point about the logical asymmetry of the universe, made above. Here we can see that it is not abstract at all. The inputs to OR are symmetrical, but the outputs are not. The TRUE input dominates. What is concealed in our understanding of the simplest logical relationship between two values is the Ghost Not delusion that it is the logical TRUE that is dominant in our universe, not the logical FALSE. Or in more conversational language, the idea that if you have a pipe next to a sign saying "Ceci n'est pas une pipe", the conclusion to be drawn from the situation is that it is a pipe and there is some strange paradox in play, rather than that it is not a pipe, which the naive (or artistic) mind might cheerfully accept - perhaps it is made of chocolate. This is all very philosophical, but is there any practical evidence that our understanding of logic is warped even at this low level? Yes there is! If you pick up any book on electronic engineering, you will find that actual electronic switching circuits are built out of basic components called NOR gates and NAND gates. These terms mean an OR with a NOT around it, and an AND with a NOT around it. It might seem rather odd behaviour for electronic engineers to make every component with an extra layer just to invert the output, with the result that all their logical theorems will be the wrong way around - which would be inconvenient as well as cost more to manufacture. But that is not the situation - they don't fit an extra layer at all. What nature actually provides is an operation that we call "OR with a NOT around it", that we cannot bring ourselves to call fundamental. The more complex English version is the simpler version in the Primary Algebra, and vice versa. Normal conversational English is logically contorted! By looking at the expression we ended up with, we can understand the problem in terms of the Ghost Not. It derives from the need to expressly move each perceived thing from the reality into the internal whiteboard before shoving it around on the whiteboard to produce conclusions. In the more complex English version, both a and b appear in the left and right hand parts of the AND. If a is TRUE on one side of the AND it will be TRUE on the other side of the AND too. Because the universe always knows what value a holds and it is always the same. The same is true of b as well. We don't care at all which the true one is. The a's and b's will actually take care of themselves, so if one of them manages to render the left side of the AND TRUE, it will contribute a FALSE on the right automatically, because of the mark around it. The viewer doesn't need to do anything on their internal whiteboard to make it so. So all we then care about is if the other value is able to produce a TRUE when NOTed, meaning that only one of the values is TRUE. The difficulty is that people are unwilling to acknowledge that the universe has a real state which is self-consistent, even if it isn't represented on their whiteboards. 1. Some liontamers are women. 2. Some women are redheads. So the correct answer is "Possibly." It is different to "Undefined", because "Undefined" says nothing, whereas the problem as given does not preclude there being a set of redheaded liontamers. Which is information that "Undefined" loses. Now we can take one step higher on the ladder of complexity, and consider the gameshow problem. We are now into areas where real-world risk assessments are distorted by the Ghost Not every day. In the problem, a gameshow contestant is shown three closed doors, and is told that there are lemons behind two of them, and a car behind the third. The contestant must pick a door, and then the host opens one of the two doors the contestant didn't pick, to reveal a lemon. Then, the contestant is offered the chance to switch choice to the third, unopened door, or stick with the original one. Most people don't believe there is anything to be gained by switching. Since they have moved nothing about on their internal whiteboard, they cannot see any way that the situation could have changed. This position omits the fact that the lemons and cars all have definite positions at all times, even though the contestant doesn't know them. Moreover the host knows which door conceals the car, because he must never open it by mistake. So the first choice the contestant made had a 1/3 chance of concealing the car, but after the host had thrown a lemon away, the remaining door had a 2/3 chance of concealing the car. The challenge is to recognise that there is an independent and self-consistent reality superior to one's own "narratisation", which one does not have full knowledge of, but which one can track and constrain one's ignorance of. Increasing complexity, but keeping important judgements like risk assessment in the centre of the frame, we can consider Beysian statistics. This is an approach to statistics invented by an English vicar called Reverend Beys, over 100 years ago. The idea is that one starts with a range of all the possible outcomes, but as data arrive, one changes the weightings of one's answer to include the further data obtained since the first sums were done. Most people just cannot get their heads around Beysian statistics, to the extent that a few years ago a major criminal prosecution in the UK failed, because the jury decided that the forensic evidence had "clearly" been incorrectly analysed by the method. In Ghost Not psychology, the problem with Beysian statistics is exactly the same as with the gameshow. People assume that their own initial and uninformed assessments are the dominant reality! There is considerable evidence that the Ghost Not has had a serious distorting effect on our physical paradigm. This topic will be covered in more detail in 3: Reciprocal Cosmology, 4: Consciousness and 5: Hypertime but for this paper, we can consider the case of the Kyoto turbines. In 1974 Myron Tribus and L. Costa de Beuregard showed that the "entropy" used in thermodynamics and the "entropy" used in information theory are in fact the same thing, although this had been assumed not to be the case until then. Information theory was created by Claude Shannon, who worked for a telephone company. His purpose was to count the amount of information that could be sent down a channel in the presence of noise. He created a mathematics that focused on what we can know about the signals being injected at the other end of a real wire, by a real correspondent, whose detailed actions we are ignorant of, and yet which are certainly occurring. This precise interest in what we can know led him to an understanding of the nature of entropy that differs in important ways from the standard assumption. When Tribus and Costa de Beauregard found that thermodynamic entropy is the same thing as information theory entropy, they found that thermodynamic entropy was not correctly understood! As proof of this, Tribus designed a gas turbine now being built in Kyoto, which is 10% more fuel efficient than previous designs. In a mature, efficiency conscious engineering discipline, such a huge improvement might as well be magic. Tribus identifies the spirit of his approach as "Beysian", and the "extra energy" comes from replacing the old "Undefined" with the new "Possibly", which allows one to seek for the possible energy waiting to be extracted. And sometimes find it. Now we can proceed to richer human situations, because the point has clearly been made that the Ghost Not has its effect at every level from the most basic logical operations up. It is not an emergent social phenomenon that requires richness or complexity to occur. In rich or complex contexts it is simply better hidden and more damaging. The Ghost Not places a negation - a sign flip - around every input to mentation at the lowest level, which emerges as a negation of the answers, like an invisible negation spread over the entire result. One effect of this is to convert inclusive thinking to exclusive thinking. Management consultants have a lament that they must sing over and over again - "Not X or Y - X and Y!" It is needed because most people immediately assume that options are by default exclusive rather than inclusive. A person being shown how to submit her website URL to Altavista became very distressed because she did not want to put "Hotel" because people might search for "Ibiza", and vice versa. The very idea that she might be able to enter "Hotel" and "Ibiza" to a sophisticated automated free text search system never even occurred to her. This effect has very serious consequences indeed. At all times, each dyadic person must believe that their internal whiteboard is reality - otherwise the cognitive apparatus for conventional perception would not be much use. If it is reality then it must be complete - they can acknowledge no deeper reality that the whiteboard must conform to. Therefore any data not already possessed by the person is regarded by them as false, and automatically denied until they are forced to accept it by direct confrontation. Then they edit history to pretend that they have always "known" the fact. This presents an insuperable barrier to learning, and in situations where force cannot be used, can bring down major corporations employing thousands of people. Finally, a result of exclusive thinking is that it simply cannot cope with interacting causes for things. Each aspect of a dyadic's life is divided into little discrete compartments, that are pretended to be each an exhaustive and complete understanding of its topic. This yields a situation where knowledge and hence understanding is held in isolated packets, which the dyadics will not integrate. Instead, they prefer to use one isolated fact that is totally unrelated to what they are denying as the basis for their denial. "Relationships always end in jealousy and bitterness." "That is the wrong way around. You can't afford to matter to someone unless that someone matters to you. No double negatives, no demonstrated yet denied hostility coded in from the start." It would seem to provide a viable origin for Laingian Knots and Bateson's Double Binds. Dyadics believe that their narratisation is real, and there is no such thing as objective reality. Therefore their principle concern is ensuring that everybody asserts that all is well, and it never occurs to them to achieve this as a side effect of all actually being well. Hence the person who attempts to improve an organisation's safety record will be lambasted for disloyally claiming that the safety record is poor. Dictators regularly torture political prisoners until they say confessions, even though they fully intend to murder them afterwards, whatever they say. Throughout all aspects of Ghost Not life, genuinely even so much as attempting to get something right will be abandoned in order to "show" that it is being got right. In all cases, this "showing" is entirely bogus, because the ridiculous play-acting involved does not represent a valid methodology for proving anything at all. Particularly since the results are always known by all to be false. The keyword is denial. People trapped in the Ghost Not will deny reality, deny their denial, deny their denial of their denial, and deny their denial of their denial of their denial. They will assert that so far as they are to blame, the goods are not late, but so long as someone else is, the goods are late. They will spend hours - sometimes days - sitting in meeting rooms adding little denial clauses to their ever more complex entanglements of "saying" what things are not. Then they are unable to do anything productive, since endorsing any action in the real world would be to contradict someone or other's false statements. Nor will they ever admit that they do not understand something. They won't even try, since they know that what the speaker is about to say is false before he has even opened him mouth. Instead they will sit pulling peculiar smirking expressions until the person trying to get through to them has utterly exhausted himself, and then just carry on as if he hadn't wasted his time. The Ghost Not is bad enough, but when it emerges together with the trick of conventional perception itself, it can create total psychopaths as required. People with no consciences whatsoever, since they can do anything they like so long as they are chanting their denial of their actions as they are performing them. People take up conventional perception so they can con themselves that things that are happening actually aren't. Before they even start their misrepresentations, their understanding is shattered by the Ghost Not. Conclusions become the exact opposite of the truth. "Deeming" - telling lies while simultaneously boasting of it and denying it - becomes a daily commonplace. With the world already inside out psychologically, conventional perception can then be used to spread an ever widening construct of pure fantasy throughout the dyadic's entire psychological arena. Wherever the chain of reasoning reaches, false constructions drive out true ones. Dyadics will not give up their false universe. They are even more slam total bloody-minded than dopamine self-addicts. Why not? The answer appears to be a deeply seated conviction that unless they hold the universe "open" by the power of their denial, it will collapse. They are very frightened of reuniting their image and real universes. The Ghost Not result stands alone, but is related to the M0 and Reciprocal Cosmology results. In M0 the Ghost Not complements dopamine self-addiction by creating a paradigm where it is not possible to ask the questions that would expose M0. Prior to M0, humans were in a state where they were neurochemically capable of exploiting feedback in cognition. Their brains could find solutions requiring modal logics, and they believed in reality. They were modal and monadic consciousnesses. It seems to be the case that initial M0 societies only suffered from dopamine self-addiction. Being unable to exploit feedback in cognition and addicted to repetitive behaviour, they became linear, but still monadic consciousnesses. This is the peasant wisdom. What they can see, they see the right way around. When people succumb to dopamine self-addiction, they don't notice anything has gone wrong. But natural immunes in the society do, particularly children. The problem is, the dopamine effect primarily prevents people from taking opportunities rather than proactively making them do weird things.. It is very distressing for naturally immune children, who often come to fear "The Bogeyman" at around the time their peers are becoming ritualised zombies. They respond to this by learning to perceive conventionally, and cease to see the evidence of something being wrong. Then they teach the self-addicts the new trick they have found for what Gurdjieff called "self calming". The Ghost Not then provides the most remarkable backup to dopamine self-addiction. The response causes far worse problems than the underlying problem ever could. Due to their greater neurological awareness, the modal dyadics (almost all natural immunes) are much more potentially destructive than the self-addicts. Although they remain willfully ignorant of it, dyadics deny the universe's richness and elegance with contempt displays at every opportunity. Their characteristic patronising and contemptuous smirk of disinterest exactly matches the introspective smirk of the self-addicts hitting on their own boredom products. The body language of ramming their noses in the air - denying their ability to see that which is right in front of them - exactly matches the self-addicts' characteristic head-lolling. The dyadics' absolute denial that anything they don't already "know" is the case exactly matches the self-addicts' fear of novelty. And their cynicism and refusal to recognise problems, let alone address them, exactly matches the self-addicts' disinterest in anything but their rituals. Dyadic contempt for the inverted universe exactly matches the self-addicts' dopamine induced self-confidence. And the dyadics' denial of their involvement exactly matches the self-addicts' first and foremost assertion that they are not to blame. Dyadic consciousness involves creating a system boundary in one's head, between one's self and everything else. It is the barrier or distinction that flips the sign of objects dragged across it in "narratisation". From this comes the concept of the observer in physics - a being that is omniscient with respect to the universe (as in the game show problem), yet not even attached to the space in which the universe evolves (and hence not subject to the red shift which effects space and the photons travelling through it, but not the photons that ultimately bind the physicist's eyeball together. This bizarre notion of an observer - who does not have a point of view as Netwon realised he had on one planet in the solar system when he discovered Universal Gravitation by observing the moons of Jupiter - coupled with the subconscious replacement of real space with an imaginary null space before mentation commences, has caused great damage to the physical paradigm. By correcting these errors, very interesting resolutions to a great many puzzles in modern physics can be described, and are so described in 3: Reciprocal Cosmology, 4: Consciousness and 5: Hypertime. The physical observer has a sociological parallel. No dyadics feel that they are actively involved in their societies (unless they are boasting of their own indescribable importance), or that they have any responsibilities within those societies since all other members are beneath their contempt. If monsters without consciences but with contemptuous smirks are committing hideous atrocities before their very eyes, they will smirk in response and explain that they themselves are not monsters - they are "observers". It was to a society composed of such monsters that the political activist Malcolm X addressed the comment, "If you aren't part of the solution, you're part of the problem." In these terms, existentialism is very interesting. Looking back at the Magritte painting, we might say that the existentialists attempted to resolve the conflict between the image or inner painting and the reality or outer painting, by abolishing reality. In doing this they made great progress, since the completely subjective and relative philosophical position this brought them enabled them to escape the ridiculous constructions of denial and rationalisation that the early 20th century inherited. But theirs was not the last word, since with the M0 falsifications and blindness out of the way, we see that there is an objective reality after all. It is possible that I've taken a different philosophical approach to the ideas in "The Laws of Form" than its author, but I'm not sure. Spencer-Brown seems to think of the void that he cleaves to form the first distinction as an abstract void with no properties until he endows it with some. It seems to me that every void ever imagined or stipulated by Spencer-Brown has been imagined by a creature living in this universe, and so the void he imagines could be inheriting a great many properties from this universe. For example, his void has space in it, which is cleavable. He can endow it (even if only in his mind) with properties. Where did the property of endowability come from? By arguing that the universe is logically asymmetrical, and being clear about what is available in this universe and what is not, I seem to have reached a much less ambiguous and more simple view of the Intersect Problem than is proposed in "Laws of Form". If accepting an epistemological constraint enables us to make useful statements one level below the primary arithmetic it will be marvelous.